Located on the southeastern part of South Carolina, Beaufort is most accessible by taking Interstate 95 down to Highway 21 at Yemassee from the north or up to Highway 278 at Hardeeville from the south. Signage to Beaufort is better than average so you aren't likely to take a wrong turn. Take whichever route is best to bring you into Beaufort. Once in Beaufort, you need to take US highway 21 east and through St. Helena. Highway 21 will take you past the national cemetery, through the historic district and on to a very scenic drive out to the Hunting Island parks. Along the way are a number of motorcycle friendly places to stop and eat or just enjoy the views. Continue on Highway 21 to Hunting Island and the road will turn south and at some point turns into Route 406. The highway will end at Fripp Island...Fripp is a private, gated community. Water, water everywhere. Beaufort has a small historic district, rivers, barrier islands, a state park (Hunting Island) with oceanfront camping and cabins for rent, a fishing pier, wildlife viewing areas, boardwalk style nature walks and a number of scenic areas for photos. Don't forget the cameras, you'll have a field day if you enjoy photography. Most roads into Beaufort are recently expanded, bridges into town are new. The older bridges and some parts of the historic district can get a little crowded and the historic district streets often make good parking a challenge. There is a lot of road construction out to Hunting Island as roads are widened. The pace is very slow in Beaufort and I see more safe driving than usual...a nice change of pace. 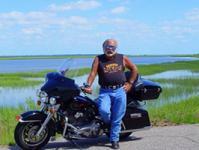 Beaufort's small, quaint historic district seems to enjoy the visits from motorcyclists. Shop owners and others have always been very happy to see us even on those cool days when we're dressed in our chaps, boots and jackets. Parking is sometimes at a premium but I've not ever been worried about the safety of my bike or belongings...Beaufort has a reputation as being safe. Along the way there are two restaurants that shouldn't be missed; - Sgt. Whites Diner is BBQ and soul food in a very relaxed setting, served up from a buffet, meat and 2 style with the world's best cornbread...lunch only on weekdays. (Yes, he's a real sergeant, retired from the USMC.) Read the NY Times article. - The Blackstone cafe is breakfastlunch 7 days each week. Breakfast is Low Country style with shrimp and grits, eggs Benedict with piles of crabmeat and huge muffins and cinnamon rolls. One of America's finest national cemeteries is located in Beaufort. A South Carolina Medal of Honor winner, Civil War heroes, The Great Santini and many more of America's finest are laid to rest here under sprawling old oak trees. If you know a Marine, he's likely to remember Beaufort as Parris Island, a basic training post for the USMC is located here. A Marine Corps Air Station often is host to air shows and other displays. The Beaufort National Cemetery was designed by and authorized by President Abraham Lincoln. The layout is a half-wheel configuration with "spokes" leading out to grave sites. The cemetery is the resting place for heroes such as Medal of Honor winner Ralph H Johnson, The Great Santini, Union Soldiers of the all Black Massachusetts 55th Infantry, more than 7,500 Civil War soldiers and others up to and including modern day conflicts such as the current war. During events like Veterans Day, motorcycles are guided by uniformed Marines from nearby Parris Island to reserved parking spots for the convenience of the riders. It isn't often you'll get that sort of service and respect and although those special ceremonies can be a bit crowded, it's worth arriving a bit early to watch the color guards and listen to local dignitaries and members of our military as they honor those fallen. Hunting Island State Park is our frequent destination. A small fee gets you in to a primitive park that has an extensive network of well paved roads, picnic facilities, restrooms, plenty of places to fish and a wide expanse of beach to enjoy. It's motorcycle friendly and safe with regular patrols by rangers who are always happy to stop and talk. Cabins are available to rent, there's a large camping facility and as part of the park, a pier is available for fishing or just relaxing and taking in the view. Along the way as you ride to Hunting Island are a nature walk...a raised boardwalk with great views and picture opportunities as well as a popular small photo-op stop . on May 22, 2010 1 out of 1 members found this review useful. Totally agree. Just went out to Hunting pier myself this morning at daybreak. Of course I am predjudice for it's scenery-live 20 miles from there. Still amazes me everytime I see the place and smell the ocean air and honeysucle along the ride.!!! on July 14, 2014 0 out of 0 members found this review useful. Ended up being about 76 miles one way. Thanks for this ride, I really enjoyed it!